To empower people to change both their bodies and minds through safe and therapeutic techniques. Run a deal campaign to entice potential students to discover The Bar Method difference for themselves. How Did Bar Method Do It? The Bar Method (TBM) technique provides students with full-body workouts to tone and slim down their bodies within a challenging, safe and fun environment. The first Bar Method studio opened in 2001. There is now a total of 75 locations across the US and Canada. Their goal was to introduce people to the Bar Method, not only to sculpt their bodies, but to reinvigorate and heal their spirits. 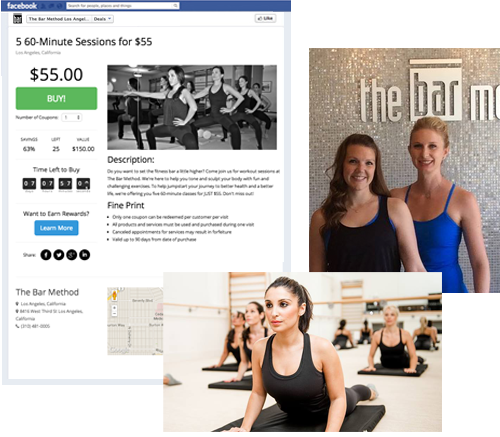 The Bar Method created a deal using Vionic Deal Maker. In a mere 48 hours, they were able to generate $2,950. Absolutely no advertising costs were involved. They simply created a deal and publicized it to their 12,000 Facebook fans. Vionic Deal Maker took care of the rest. Customers conveniently purchased right from TBM’s Facebook page and funds were immediately deposited into the company’s account. This short-lived campaign set the bar high for local competitors, giving The Bar Method a real marketing advantage.